Through this six-lesson series children will learn that sin has consequences and that following God's way is best. The lessons cover the big picture of redemption--how God was working in the books of Joshua, Judges and Ruth and how faithful and merciful God was even in the midst of Israel's unfaithfulness. This six-lesson series teaches children that even in the midst of Israel’s unfaithfulness God was faithful and merciful. Includes entering Canaan (spies, desert wandering and crossing Jordan), Rahab, Judges (Shamgar, Deborah and Samson), Gideon, Naomi and Ruth. 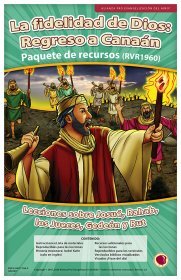 Spanish teacher text for God's Faithfulness: Return to Canaan.This six-lesson series teaches children that even in the midst of Israel’s unfaithfulness God was faithful and merciful. Includes entering Canaan (spies, desert wandering and crossing Jordan), Rahab, Judges (Shamgar, Deborah and Samson), Gideon, Naomi and Ruth. Includes lesson outlines, detailed story line, review questions, and more. Disc 1: Overviews, counseling and Bible lesson demonstrations. Disc 2: Full demonstrations of all songs suggested in the series: God's Way, I Believe, I'll Stand for God, Tell Everyone, Three Questions, Proverbs 3:5-6 (Trust in the Lord). 11" x 17" full-color resources: Bible timeline and map additions, memory verse visuals, Word-Up (main truth of the lesson), resource booklet (review games and activities), UPS Rules, mission story on Isobel Kuhn. 8 1/2" x 11" back/white lesson reproducibles: memory verse IPEARS and bookmarks, Quiet Time sheets, skits, signs, Wonder Time. 11" x 17" full-color resources: Bible Timeline & map additions, memory verse visuals, Word-Up (main truth of the lesson), resource booklet (review games and activities), UPS Rules, mission story on Isobel Kuhn. 8 1/2" x 11" back/white lesson reproducibles: memory verse bookmarks, Quiet Time sheets, skits, signs, Wonder Time. 11" x 17" full-color resources: memory verse visuals, Word-Up (main truth of the lesson), resource booklet (review games and activities), UPS Rules, mission story on Isobel Kuhn (with English text). 8 1/2" x 11" back/white lesson reproducibles: memory verse bookmarks, skits, signs, Wonder Time. PowerPoint visuals to teach six lessons for God's Faithfulness: Return to Canaan. PPT visuals include flashcard visuals, memory verses (ESV and KJV) and words to suggested songs. PDFs of lesson text and other helps. Includes additional GNC resources: Word-Up visuals, master planning chart, resource, preschool plan, booklet, Books of the Bible poster, map, time line, time line pictures, map pictures, reproducible coloring sheets and Quiet Time sheets, UPS rules and mission story on Isobel Kuhn.